Deshaun Watson threw for 400 yards and four touchdowns in a 41-38 loss to the Seattle Seahawks on Sunday. Richard Sherman complimented Watson after the game, saying it was the best game any quarterback has had against the Seahawks’ legendary defence. Though the Houston Texans didn’t win the game, the decision to draft Watson with the 12th pick has looked increasingly smart. 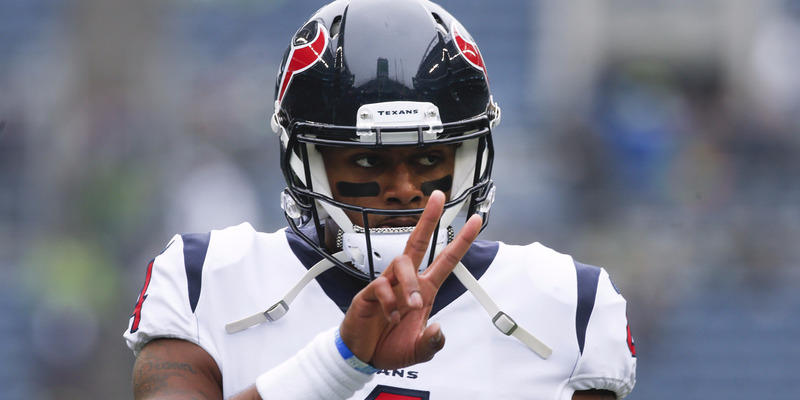 We’re only halfway through the NFL regular season, but Houston Texans quarterback Deshaun Watson may have already sealed Rookie of the Year with his Week 8 performance. Watson put on a show in a quarterback duel against Russell Wilson and the Seattle Seahawks on Sunday, with the Seahawks narrowly edging out the Texans, 41-38. Watson threw for 402 yards on 19-of-30 passing with four touchdowns, and three interceptions, the last of which was a game-sealing pick by Richard Sherman. But the stats don’t necessarily tell the full story on Watson’s game. Perhaps most telling is what Sherman, one of the best cornerbacks in the NFL, revealed to The MMQB’s Peter King about what he told Watson after the game. As King noted, the Seahawks’ defensive core has played Tom Brady in the Super Bowl, Peyton Manning in the Super Bowl, and has played Aaron Rodgers five times in six seasons. Watson apparently topped all of them. The 11 teams that passed on Watson in the draft may have been kicking themselves on Sunday. The Texans took Watson with the 12th pick after trading with the Cleveland Browns to move up in the draft. That now looks like a genius move by the Texans and a not-so-wise decision by the winless Browns, who still have no answer at quarterback. There were other quarterback-hungry teams in the draft that passed on Watson, too, as fears grew about how he could adjust to an NFL offence. The Browns passed on him twice, taking Myles Garrett with the No. 1 pick before trading with the Texans. The Chicago Bears took Mitchell Trubisky, who has played well, but not at the level of Watson. The 49ers passed on Watson. The Jacksonville Jaguars drafted running back Leonard Fournette to take the ball out of Blake Bortles’ hands; Watson may have still been a smarter move. The New York Jets delayed their quarterback search for another year, while the Cincinnati Bengals took a wide receiver and the Kansas City Chiefs drafted Patrick Mahomes to one day replace Alex Smith. Even Watson’s interceptions come with some asterisks. Two came on great reads by the Seahawks’ defence (though one throw he probably should have held onto), and the last, as mentioned, came in an end-of-game, desperation situation. Sherman continued his praise for Watson after the game. The Texans have been hurt by injuries to a normally stout defence, but have stayed alive thanks to Watson. One of the most dreadful offenses last season has come alive under Watson, who has seemingly revived wide receivers like DeAndre Hopkins and Will Fuller (who undoubtedly make Watson’s job easier with their speed and hands) and running back Lamar Miller. Since Week 2, Watson’s first career start, the Texans have scored 203 points, which is more than 27 other teams have scored all season. At 3-4, the Texans are fighting to stay alive in the AFC South and haven’t been helped by a tough schedule. The goal is obviously to make the playoffs this season, but with Watson at the helm, it appears there will be plenty of postseason appearances in the Texans’ future.